The constantly intensifying battle against viruses and antibiotic-resistant “superbugs” isn’t only about finding stronger drugs against infection. The focus is moving to preventing infections in the first place. That’s why large companies such as Carrefour and a Far East luxury hotel chain are looking at unique germ-vanquishing textiles invented by Jerusalem’s Argaman Technologies and manufactured inside its custom-built factory. Textile engineer Jeff Gabbay, founder and CEO of Argaman and inventor of CottonX, led ISRAEL21c on an exclusive tour of the factory, where enhanced copper-oxide particles are ultrasonically and permanently blasted into cotton fibers using an environmentally friendly technique. Ninety-nine percent of bacteria and viruses are killed within seconds of coming into contact with copper oxide, and bacteria cannot become resistant to copper oxide as they do to antibiotics, Gabbay explains. Hospital-acquired infections cost US hospitals about $25 billion annually. A trial by the US Centers for Disease Control has recently been completed, checking the effectiveness CottonX sheets, pillowcases, and pajamas to reduce hospital-acquired infections. Results will be published soon. CopperX is being developed into reusable, comfortable face masks for the Greater China market, where airborne pollution is a major problem, says Edwin Keh, head of the Hong Kong Research Institute for Textiles and Apparel. This government-run, nonprofit applied research and commercialization center was introduced to Argaman last year as the result of the industrial R&D memorandum of understanding signed by Israel and the Hong Kong Special Administrative Region of the People’s Republic of China Hong in February 2014. One of the largest garment manufacturers in the world, also based in Hong Kong, became a strategic investor in Argaman. Keh tells ISRAEL21c that in addition to the masks, his institute also is testing the applicability of the self-sterilizing, hypoallergenic CottonX material in airline cabin interiors and in hotels. Keh says he hopes to pursue collaborations with additional Israeli companies offering advanced technologies for the textile industry, especially in water management, spinning, dyeing, weaving and cotton agriculture. “We want to make a success story out of our collaboration with Argaman and we hope it will be the first of many,” says Keh. 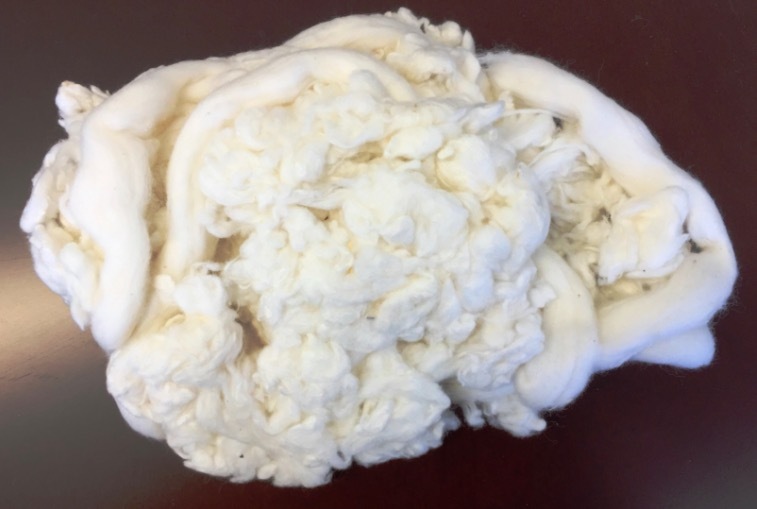 Keh is also interested in some other properties of CottonX aside from germ control. Embedding varying concentrations of copper dioxide also makes the fabric fire-resistant, electricity conductive (potentially useful for medical monitoring and military markets) and capable of banishing facial wrinkles and even cellulite. “We know how much active ingredient we need in the fibers to be effective for different purposes, from banishing wrinkles to killing stubborn bacteria. By being able to control the active ingredient content we can assure completely consistent quality in everything we do,” says Gabbay. CottonX healthcare socks for preventing athlete’s foot and diabetic foot ulcers will soon be launched. Cosmetic textiles — facial mask, pillowcase, gloves, socks and scarf, each premium packaged with an all-natural bio-inhibitive cream infused with accelerated copper oxide – are being developed jointly with a US company headed by a former L’Oréal and Revlon executive. Argaman also is in discussions with a global fashion firm to create a new “lifestyle” brand of products. Still in the development stage at Argaman are garments that can deliver transdermal chemotherapy or other pharmaceutical treatments and an optic-fiber-embedded material that could deliver phototherapy to psoriasis patients or to jaundiced newborns. Argaman is a member of a new five-year consortium established in the Israel Innovation Authority’s MAGNET program, which aims to unite technology and industrial companies with academic research institutes to develop technologies for producing “smart” fabrics. “Not only are we built to take the concepts from academia — plus a lot of our own ideas — to the level that industry needs but we also have the ability in-house to supply all industrial members the understanding of the science, samples and industrial quantities of the new materials should the concepts go commercial,” Gabbay says. Urban gardening is all the rage in busy Israeli urban areas including Tel Aviv, Haifa, Beersheva and Jerusalem. The upper parking lot of the Dizengoff Center shopping mall in Tel Aviv is a concrete maze of cars. There is also a hothouse up here with the freshest green vegetables you’ve ever seen. While gardening on the roof of an urban parking garage may seem absurd, Yarok Ba’ir (Green in the City) is serving city dwellers – and restaurants within a 2-kilometer radius — straight-from-the-farm veggies. Green in the City is a joint venture between LivinGreen, a company that pioneers hydroponic and aquaponic solutions, and the Dizengoff Center, opened in the 1970s as Israel’s first shopping mall. “The main goal of Green in the City is to bring agriculture to the middle of the city, to be able to grow food right in the heart of the city,” Yoav Sharon, co-manager of Green in the City, tells ISRAEL21C. The first commercial farm in Tel Aviv consists of a hothouse and areas for workshops where local residents can learn how to build urban mini farms at home or school. The urban farm grows nearly two dozen varieties of veggies and herbs (among them lettuce, basil, tomatoes, mint, kale, cucumbers and green onions), producing some 15,000 heads of leafy greens each month. Demand is so high that Green in the City now boasts three stands in the Dizengoff Center. All three operate on an honor system. “There’s nobody at the stands to sell the vegetables. Everything is labeled. Customers pick what they want and deposit the right amount of money into the box,” he says, noting that Green in the City sells more than 1,500 products per week. Green in the City launched in the winter of 2015 to demonstrate urban farming and to show that growing greens in a city is not only possible but viable. Today, 54 percent of the world’s population lives in urban areas, according to the Food and Agriculture Organization of the United Nations. That number is expected to increase to 66% by 2050. To feed the growing numbers of city-dwellers, urban farming is crucial. That’s why the hydroponics project in downtown Tel Aviv has garnered international interest. The UN reports that 800 million people worldwide grow vegetables or fruits or raise animals in cities, producing 15-20% of the world’s food. This trend can make an important contribution to food security, especially in times of crisis or food shortages. LivinGreen, one of the partners in Green in the City, runs two aquaponics projects in collaboration with the UN’s Food and Agriculture Organization, in Ghana and Ethiopia. Growing locally also means fresher veggies. While air pollution in the city and in the parking facility under Green in the City can’t be good for the vegetables, Sharon says the mesh netting around the hothouse keeps most of the harmful pollutants at bay. He also notes that Green in the City has sent samples of its leafy greens to be checked in a lab. Pesticides and other chemicals usually sprayed on rural farms, he notes, are absent from these greens. The vegetables are grown in beds filled with clean water, fertilizer and minerals. A fish aquaponics system cleans the water naturally. Israel, known for its agriculture technologies, is strong in the hydroponics field. Green in the City is one of many urban green spots blooming around Israel. The Society of the Protection of Nature in Israel has an ongoing grassroots project that helps residents build and maintain community gardens. In the past 15 years, some 300 community gardens have been planted around the country on formerly barren patches of land. The Onya urban environment nursery of young eco-conscious visionaries grows greenery and offers urban gardening workshops in the concrete sprawl also known as the Tel Aviv New Bus Station. At Totzeret Gimel-Urban Farmin one of Beersheva’s more neglected neighborhoods, farmers and volunteers grow seasonal vegetables to sell to neighbors and local restaurants. Totzeret Gimel also promotes a local and sustainable model of urban agriculture. CityTree Tel Aviv and CityTree Haifa offer a slew of ecological-based programs including composting workshops and community garden outreach. And the Muslala Arts Collective built its Gag Eden urban farm atop the Clal Building in downtown Jerusalem. Gag Eden hosts courses and workshops on container growing, green walls, hydroponics, the sustainable kitchen and medicinal herbs. The wines of Israel are winning well-deserved notice internationally. The late, great wine expert Daniel Rogov pronounced Eyal Rotem's Clos de Gat “a world-class winery.” Eli Ben-Zaken of Domaine du Castel was named Chevalier de l’Ordre National du Mérite Agricole by France in 2013—high praise indeed from a country considered by many to be the end-all of fine wines. And Castel has taken home many other prizes, including the prestigious Decanter World Wine Award—the Oscar of British wine prizes. The great oenological arbiter Wine Spectator included Recanati’s 2012 Cabernet Sauvignon Galilee on its 2014 list of Top 100 Wines. And the list of accolades continues to grow along the Negev wine route. The cover story of Wine Spectator's October 2016 magazine was dedicated to Israeli Wines as reported by Israel21C. Carmel Winery, based in Zichron Ya’acov and Rishon Le Zion, offers a perfect metaphor for how Israel is establishing itself on the cultural world stage. Founded in 1882 by Edmond de Rothschild, Carmel is Israel’s largest winery, and the oldest still in operation. For many years, it produced wine chiefly for ceremonial purposes—fine vintages were out of the question. But starting in the late 1980s, Israeli demand for superior wines was clearly intensifying, and Carmel played an important part in that sea change. The vintners at Carmel realized some time ago that trying to copy the techniques of Old World winemakers would not work here. Israel is a hot country, so they brought in wine experts from warm climates: California, Argentina, Chile, South Africa, and Australia. Their chief winemaker today is Lior Lacser, who has worked in France (both Burgundy and Bordeaux) as well as in Australia. Carmel now also has two small, state-of-the-art wineries producing small quantities of handcrafted wines: Kayoumi Winery in the Upper Galilee, and Yatir Winery in the northeastern Negev. Carmel Winery has won many international prizes, including the prestigious Decanter World Wine Award for its 2008 Kayoumi Single Vineyard Shiraz. It continues to wow wine experts with its old-vine Petite Syrah and Carignan, Mediterranean-style prestige blends, and more. As you stroll from building to building at Carmel Winery you might be treated to the site of Lior Lacser, Carmel’s chief winemaker, hurrying by. Stall him with a question, and Lior may demur: “I’ve got to go . . . I’ve got to go!”—as pressed for time as the White Rabbit from Alice in Wonderland. Lior is young and intensely focused—refreshingly impatient with visitors—he obviously has big things on his mind. Rehabilitating the behemoth of Carmel took great expertise and concerted drive. Originally from Tel Aviv, Lior studied in Burgundy, and has worked at wineries in Bordeaux and Australia. He oversees wines made from Carmel’s nearly 3,500 acres of vineyards, from the Upper Galilee in the North to the Negev in the South. His inner sanctum is by the small tanks for experimentation at Carmel’s microwinery. This is where Lior can let his brilliant fantasies run loose, blending new grapes being grown high in the hills to create the wines for Carmel. Project Wadi Attir is located in the northern Negev near the Bedouin town of Hura. It was founded by Michael Ben-Eli, who heads a global initiative called the Sustainability Laboratory. The project’s aim is to find a way to combine Bedouin culture and experience with progressive notions of sustainability and “green” technologies—looking at renewable-energy production, recycling, land stewardship, and much more. Project Wadi Attir serves as a model for Jewish-Bedouin collaboration. “It is good for the people. It makes them feel good as citizens. It makes them proud to be part of Israel. Ben-Eli met with Muhammad al-Nabari, the forward-thinking mayor of Hura, and they teamed up to bring Project Wadi Attir to light. A joint effort between Ben-Eli’s Sustainability Laboratory and the Hura Municipal Council, the project is decidedly holistic in its approach: dealing with social, economic, environmental, as well as tech considerations. Collaborators include Bedouin community members, university scientists and researchers, local nonprofit organizations, a nearby kibbutz, government agencies, and private-sector companies. The hope is that this new vision of environmentally sound development—beneficial to all parties—may impact the entire Middle East region as well as other parts of the world. At the Project Wadi Attir farm, Bedouins tend goats and sheep organically for the production of dairy products. They grow medicinal plants and herbs (based on traditional Bedouin healing methods), and have developed a line of health products for sale on the mainstream market. Indigenous vegetables were once an important part of the Bedouin diet, but many were nearly eradicated; these have been reintroduced and are cultivated organically, and a seed bank has been established for these precious plants. Hundreds of olive trees have been planted by local Bedouin high-school students, into soil enhanced and irrigated with the help of scientists from the Blaustein Institutes for Desert Research. Learn more about New Israeli tech, old Bedouin ways at Wadi Attir at Israel21c.org. What exactly is biochar and how does it work? While it seems a very twenty-first-century topic, biochar has actually been around in some form for centuries: the pre-Colombian Amazonians developed a dark, rich, and fertile soil, terra preta, or “black earth,” using a similar method. In brief, biochar is a kind of charcoal made from organic materials that have undergone a firing process known as pyrolysis, which takes place in the absence of oxygen. Added to soil, biochar can improve fertility and, by “sequestering” carbon—that is to say, by not allowing it to be broken down easily or rapidly—can reduce emissions from the biomass that would otherwise naturally degrade into greenhouse gases. The carbon in biochar resists degradation—in fact, biochar can hold carbon in soil for hundreds, even thousands, of years—thus preventing it from re-entering the carbon cycle. If you could continually turn a lot of organic material into biochar, you could, over time, reverse the history of the last two hundred years. . . . We can run the movie backward. We can unmine some of the coal, undrill some of the oil. We can take at least pieces of the Earth and—this is something we haven’t done for quite a while—leave them Better Than We Found Them. Biochar, to put it simply, is a method of replenishing soil with carbon, making it rich and fertile. It is also a potential tool in the battle against climate change. One of the chief causes of global warming is the overload of carbon dioxide as a “greenhouse gas” in the air: humans produce CO2 (chiefly by burning fossil fuels, such as coal, natural gas, and oil, for energy and transportation), and also have depleted natural systems—like forests—that remove CO2 from the atmosphere. Biochar has the potential to mitigate that process; in fact, well-designed biochar systems can actually be carbon negative, because they result in the net transfer of carbon (which began as carbon dioxide in the atmosphere) to the soil, where it can be stable for a very long time. In other words, biochar may present a way for us to start taking back some of the carbon that humans have poured into the atmosphere. The film: "Solutions from the Land"
Tulip Winery in Kfar Tikva. Photo courtesy Tulip Winery. It may seem surprising that a country as small as Israel can boast such a diversity of terrains for its vineyards. Indeed, Israel’s wine industry is so varied and flourishing that visitors can now follow a wine route that stretches the length of the country: from the green Galilee and Golan Heights in the North, through Mount Carmel, Sharon and the coastal plains, and the Judean Hills, down to the hot, dry Negev Desert in the South. Driven by new technologies, new ideas, and new consumer appreciation for fine wines, Israel is undergoing what many are calling a wine revolution. Each region has its superstars and its newcomers, its traditionalists and experimenters. While the industry is decidedly dominated by men, there have been some talented women in the field: Orna Chillag (Chillag) and Na’ama Sorkin (Dalton) are two notable examples. The Tulip Winery in Kfar Tikva has a unique business model: many of its employees are adults with disabilities and special needs. Driven by new technologies, new ideas, and new consumer appreciation for fine wines, Israel is undergoing what many are calling a wine revolution. For many years, Israeli vintners complied with halakha—Jewish laws—and ensured that their wines were kosher by heating or even boiling them. This process inevitably impaired the quality of the finished product, and kosher wine was generally known as a sweet and inferior gastronomic product. Yet as Israeli winemakers began to aim toward producing higher-quality wines, the modern Israeli wine industry found ways to meet kashrut requirements (that is, the Jewish dietary regulations) without ruining the wine. Winemakers no longer boil their wines; instead many of them bring in authorized supervisors whose role is to oversee the production and handling process. So today’s Israeli wines can be both kosher and pleasing to the most discerning palate.